Another Spanish classic… Very much like the tortilla de patatas [potato omelette], there are many versions and interpretations. And, as you might guess from previous posts, the best empanada is going to be the one cooked by the proverbial Mother-in-Law… Actually, at some point, I had scribbled down a recipe that had been in someone’s family for generations. But hélas!, I lost it during one of my many moves. I ended up to use the one Carlos Horrillo and Patrick Morcas have on their Tapas: Simple Flavours, Striking Combinations book. All in all, it is not exactly easy to get this dish right. The filling is relatively straightforward, but the pastry requires a certain level of skill and commitment. Although this might sound like scratching a chalkboard with nails to some, I ended up using pre made pastry, to avoid any culinary catastrophes… In any case, it is an awesome combination of flavors and textures, which reminds me of home and many bohemian nights out. Place a large heavy base, non stock frying pan (or wok) on a low heat with 8 dashes of olive oil. Add the sliced onions and pepper, a pinch of salt and pepper then sauté gently until soft and tender. Add the chopped tomatoes and give everything a good stir, then simmer gently until all the ingredients have reduced to a thick sauce. Add the tuna, olives, saffron and another pinch of salt and pepper, Summer everything together, stirring regularly until you have a tick, rich sauce. Set aside to cool, and then refrigerate for 2 hours. Lightly flour your work surface and place the rolled puff pastry on top. Using a sharp knife, cut the pastry into 12cm squares and arrange them on several greased baking sheets. You will need 8-12, depending on how many people you are going to serve. Gauge it so you have enough pastry to wrap the filling. If the pastry is too thin the parcel will burst and all the ingredients will spill out. Some spillage is fine. If the pastry is too thick, it will not allow the flavours of the filling to come through. Put a dollop of the tuna mixture, a ball shape roughly 5-6cm, in the middle of the square, and then dab the edges of the suare with eaten egg, Bring up the corners of the pastry to the centre and press them together to form a peak at the top. Glaze the tops with beaten egg, and then in the oven for 20min, or until golden brown. Serve hot, warm or cold. Alternatively, you can put the pastry in the a rectangular or square baking tray, allowing the wall to be coated about 5cm. 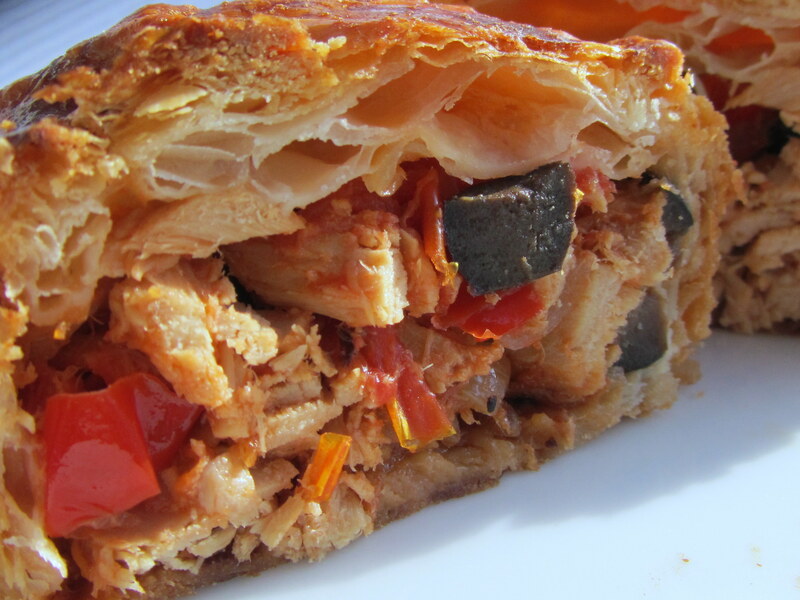 Put the tuna mixture on it, and put another sheet of pastry on top. Close the edges, sealling with beaten egg. Glaze the top with beaten egg. 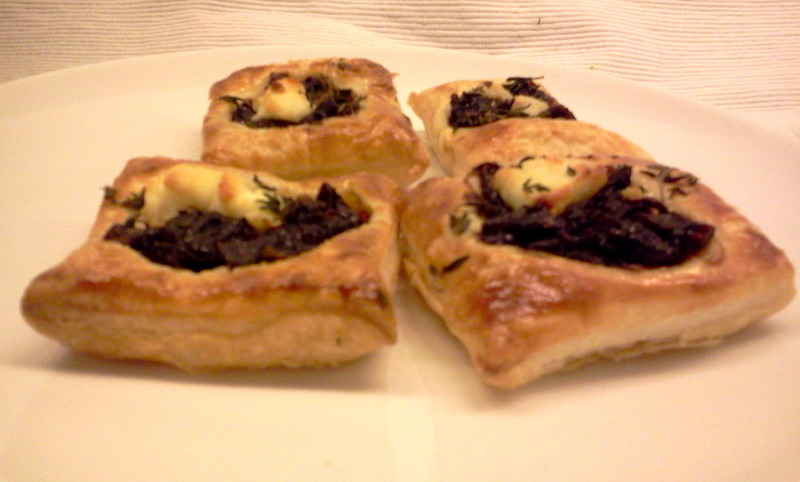 I first saw the onion confit and and goat cheese tartelettes on Mafalda Pinto Leite’s website (here, in Portuguese). It looked easy enough, but things went South when ready-made caramelized onion the recipe called for was nowhere to be find in Zurich. The only solution was to embark on a quest for the perfect red onion confit recipe. Finally, it was C’est moi qui l’ai fait who offered the perfect method for a luscious red onion confit. And, since they had gone through all the trouble of doing their own jam from scratch, it was only fair to give it a go to their tartelette. It was a good call – the whole batch was gone in less than a sigh. Spread a bit of flour all over the kitchen top, and lay the pastry roll. Mix the yolk with the milk, and brush it all over the pastry surface. Cut it in squares (4cm side), and place them on the baking tray. Drop a teaspoon of onion confit at the center of each square (the corners should be free, so they can puff). On top of the confit, put the equivalent of a small teaspoon of cheese. Sprinkle with fresh thyme. It is now ready to put on the stove, for about 8min, or until the pastry is golden.